This is a tale of two men, each living in the best of times. Alexei Kazantsev,33, Russian emigre sculptor. Covington resident. Mission: to unlock the energy that exists in a block of marble, expressing the power of nature and the beauty of the human form. Edwin Neill, a man of youthful appearance-who just might have an AARP tucked away in his wallet-president of the Neill Corporation, largest distributor of Aveda beauty products in the United States. Hammond entrepreneur. Mission: to unlock the beauty that exists in each man or woman, through pampering and an environmentally sound lifestyle. It may sound a bit like the old Pygmalion story, the tale of a statue that comes to life when the artist falls in love with his beautiful creation and kissers her marble lips. But in this case, the sculptor has the help of an art loving multimillionaire whose goal is the creation of beauty, in both his business and his personal surroundings. 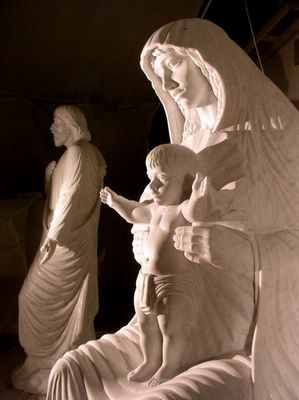 Together, Kazantsev and Neill are populating the countryside of southeast Louisiana with marble sculpture, monumental in scale, that celebrates in traditional materials the power and beauty of the human form in nature. Alexei Kazantsev was born in Alexandrov, 100 kilometers from Moscow. From age 7 to 10, he was confined to a Russian clinic, strapped in a bed to correct a rare medical condition of irregular bone growth. "Let me tell you," he says, the melancholy Russian surfacing in his lilting voice, "I lie in bed- just a kid- day after day. The spots on the walls, they start to make patterns. So I draw them. And then I start drawing everything. But I'm not an artist then. "I get out of hospital, and I decide I want to be auto mechanic. Yes. So I am just a kid for a few more years: maybe I draw, maybe I don't. Then when I'm 13 or 14, my mother, she says, you draw so good, Alexei, why you not go to Moscow and study with your uncle the famous sculptor? Before I know it, I'm in Russian artistic underground. In 1993, I have chance to go to America as a tourist. I take it. Here I am. "Edwin Neill is a visionary, with the power and means to impose his vision on the world. Edwin makes things happen around him," Kazantsev says. He gestures toward his patron, who dashes up a staircase to serve as chairman of yet another meeting. The Neill Corporation's headquarters in downtown Hammond occupies renovated high school buildings. Restored cottages on adjacent streets serve as homes for students attending beauty and lifestyle courses' at the center. Group luncheons and inspirational meetings are part of everyone's day. A health club and daycare center are taking shape in the old school gymnasium that Neill is developing across the street. Neill's wife, Debra, is in charge of the company's Consumer Livestyle Division. "It's like communism was supposed to be-for the good of the workers. But the good got lost along the way in Russia. Here it still works," Kazantsev muses. Several employees nod in agreement. "For me, the best part is the sculpture garden," he continues. " I throw some ideas around and Edwin tells me what he likes. Then I just do it. 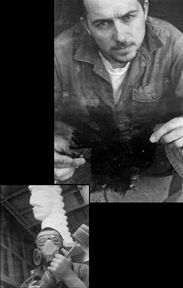 We meet in the fall of 1996, and by the next spring I'm doing outdoor sculpture for his home." The sculptor's lipid blue eyes dominate a face that is framed by a slight, dark Bolshevik-style beard and curly hair that terminates in Romanov ringlets. Kazantsev is a paradox in both appearance and philosophy. Although he works in marble, the most traditional of materials, he attempts to express the powerful forces that shape the universe. Walking through the Neill Corporation's sculpture garden, which is open to the public, Kazantsev explains the ideas that guided the design of the space and the four sculptures.
" The pieces are called 'The Energies:Earth, Fire, Water and Air.' They're arranged in a spiral that rises to show how all elements are linked. Fire rises above earth to water and the air on the tallest column, 13 feet high. But you know the Chinese have a fifth element, wood. So we plant an oak tree in the middle to include their philosophy too. "I go to Italy to select marble from same quarry as Michelangelo. Carrara. The best, like the Pieta in Vatican. There are over 500 quaries in the area, big, big like an ant pile. I search out Polvaccio Quarries, and they say, yes, this is Michelangelo's. "These energies-all female. Woman is passion. But something is missing. So I add fifth sculpture-seperate, you see it from the main road- the male. To express balance in universe. "You can feel the forces at work. Ancient societies respected the energy of stone, which has a million years of history locked in it. Michelangelo said, hey, I just release the energy locked up in marble. I do the same. The male figure, "Balance," is a solid primitive image, reminiscent of middle-American stone sculpture. The flowing lines of Kazantsev's figures and his evocation of natural forces invite comparisons to the work of sculptor Enrique Alferez, who died last week in New Orleans at the age of 98. Alferez's "Fountain of the Four Winds" at New Orleans' Lakefront Airport and his figures in the City Park Botanical Garden are spiritual cousins of the Russian sculptor's "Elements." "There has been much inner turmoil for me this year, much emotion," Kazantsev confides. "I am 33, he was almost 99. Lots of 3's. Maybe there's something going on there." Some of this turmoil surfaces in the undulations of "The Waves of Creation," a series of eight sculptures, approximately 7 feet tall, that sit on a 50-foot-long curving wall in the field surrounding Edwin and Debra Neill's rural home near Hammond. The three pieces to the left represent the female, those to the right provide the masculine balance. Figures are caught in the waves, some whole, some represented only by hands, faces or feet- to Kazantsev the most important parts of the body. They come together in a central spout, from which water plunges to a basin below. Carved into the top of the basin, which blends elements of a Romanesque baptismal font and the curves of an Ionic capital, are the faces of the Neill's two children, Paris,8, and Garrison,11. "Is simple," Kazantsev explains. "Man and woman come together in nature and create babies." Kazantsev has placed the individual sculptures along the pebbleaggregate wall in a manner that suggests fragements of ancient sculpture on the Acropolis in Athens. Or the arrangement of the Elgin Marbles in London's British Museum. By doing so, he expresses the history of the marble and allows the viewer to associate the works with the great traditions of western sculpture. It also conveys the artist's belief that his sculpture is never finished. "It's like a parade icon- a statue or a painting- in Russia. Every time it is brough out in front of people, it gains something from their energy. These icons are very powerful," he explains, "because they carry with them the beliefs of the people who have seen them." Kazantsev selected 54 tons of Carrara marble for this project and has used 36 tons so far. Eighteen tons remain at his studio, two blocks waiting for their energy to be released. "Maybe Debra will let me do a mermaid and one other figure to go beside the pool," he suggests. "She and Edwin have dreams, and I can make them come true." Garrison Neill has other plans for the artist. 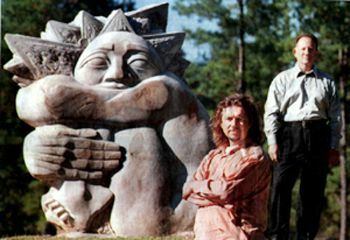 In 1997, Kazantsev executed "Morning Sun" and "Evening Moon" in Arkansas sandstone for the garden. The sun, carved in yellowish stone raises his head high. The pale blue moon cradles her head in her hands. The 11-year old son Garrison thinks "an eclipse would be really cool." "I love Alexei's work," he continues. "Especially the sun and moon." "Cuz when my sister Paris and I play hide and seek, I get up on top of the moon where she can't see me lying still. "The kids on my school bus all ask me, is my dad obsessed with his sculptures or what? I guess he is. But my sister and I like them, too. We could use a couple more, don't you think?" Kazantsev gestures across the field to "Candle of Life," an 11-foot-tall sculpture of a woman who burns with the flames of life. "We come from the water, the fountain. But we burn like a candle in our lives. "You know, in 1996, I did a figure of an angel playing a modern trumpet for Louis Prima's tomb. Maybe it looks like Prima, I don't know. But even in death there is life. That's what I'm saying. It goes on." Kazantsev is hungry for knowledge, the answers to the great mysteries of the universe. But also just plain hungry, he wanders through the Neill's expansive home, each room furnished in a different period of antiques. "You want an apple?" he asks, reaching into a large bowl of fruit and extending his hand in a Garden of Eden gestures. "No? Then I take it." Outside, he suggests, "You want to go back to town and get something to bite?" Why not? The answers just might be waiting in a plate of fajitas. Sculptor Alexei Kazantsev believes in following his own star to make a place for himself and his artwork. He's been in the United States less than three months, but already he has secured an apartment (rent-free, except electricity), a gallery to show his works and a makeshift studio-right here in Lincoln. Kazantsev, a Russian, got some help from an East Indian immigrant who admired his talent and identified with his adventurous spirit. Amrita Mahapatra, owner of Surya Gallery, 227 N. Ninth St., saw a bit of herself in Kazantsev, 26, and his friend Boris Bendikov, 24, both of whom are visiting the country on temporary visas. What attracted me was that they came with nothing, They just picked up their bags and came over to follow their dream. One day, that was how we came to America," Mahapatra said. She and her husband Sachi, a cardiologist, emigrated to the United States in 1977, They've been in Lincoln since 1985. Kazantsev and Bendikov, an amateur photographer, were taken aback by their good fortune in meeting the Mahapatras. Kazantsev talks a great deal about fate, guardian angels and the mythical "star" that guided him here. Not surprisingly, those themes crop up frequently in his sculptures and watercolor paintings. "Like people in the past, he believes he is following after a star... Our meeting with Amrita supports this feeling," said Bendikov, who acted as translator in a recent interview. "We didn't think great things would happen very quickly. We have to say thanks," said Bendikov, who plans to leave at the end of December. Kazantsev plans to stay at least six months. "The Midwest is the best place. It seems to me to be the base of America," he said. The Two Muscovites had been staying with Lincoln friends Yuri and Lori Plotnikov in a small apartment since late October. The first gallery they visited was Surya, and got more than they bargained for. Mahapatra was so impressed with the pair that she offered them an apartment above the gallery, a workspace for Kazantsev and the promise of at least one exhibit. She said her goodwill is simply a matter of reciprocity. "God, it sounds noble, but I'm doing it because when I came (to this country), everyone helped me like that," she said. "As I talked to him (Kazantsev) more, what really impressed me was that he is very humble when it comes to his own person, he doesn't demand or ask for anything. But when it comes to his art, oh, you don't touch it with dirty hands...and you don't just put it anywhere. It has to be in the right light and everything. I liked that," she said with a laugh. 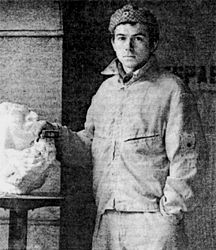 Kazantsev left Moscow because he wanted to absorb another culture and establish an identity away from his uncle, a prominent Russian sculptor with the same last name. Several years ago, this confusion led the Russian ministry of culture to purchase a marble bust by Kazantsev, thinking it was created by his uncle. He since has abandoned that smooth, classical style for a mix of abstract imagery and primitive Christian symbols that resemble ancient artifacts. This style, an outgrowth of his devotion to the Russian Orthodox faith, gives him the feeling that he has "broken the soul of the stone." Kazantsev's makeshift studio is actually the back porch of the gallery, where he often chips and hammers into the night, regardless of the weather. He sculpts primarily in plaster, marble, bronze, and limestone; the sizes range from life-size bodies or busts to palm-size figurines. One of his biggest projects, through, has less to do with art than with survival: he spends one or two hours a day studying English. Right now, he's limited to short sentences and exaggerated hand gestures. But his bright eyes and sincere laugh reveal a passion that has carried him halfway around the world to create art in a strange land. The all-important question, "Do you plan to stay in America?" is shrugged off with a casual "Why not?" and a quick smile. For almost three years, Alexei Kazantsev has toiled to build a reputation as a sculptor and painter, at the Surya Gallery, on 9th Street. By migrating to Lincoln, Alexei left the comfortable distinction of being his uncle's apprentice, a renowned Russian artist, to start over at zero. Alexei's most recent show was an exhibition of paintings, and sculptures (both stone and clay) at the Surya. It included works that were inspired by a recent visit to New Orleans. He was intrigued by the blending of cultures typical of the French Quarter. In fact, one of his pieces at the Surya show is called "New Orleans Jazz Band," and was a three piece set: A guitarist, a stand-up bassist, and a saxophone player. The New Orleans gallery requested more pieces, which he personally delivered in May. First, however, he proposed to his girlfriend, Catherine Fritz, (Lincoln residents might know as the guitarist of the Andean musical act, Kuzitaki). Also in May, Alexei was offered a contract by a private collector who had purchased sculptures at the New Orleans show. Though his future appears certain now, Alexei has observed first-hand the saturation of artists in the Lincoln area. "There are too many painters out there..sculpture makes me unique as an artist."